Hosting an event is not without its trials and tribulations. The planning process can be fraught with road bumps, and any number of things can go wrong on the day to turn the event from magical to catastrophic. Thankfully, there are a few simple steps you can take to ensure you cover your bases, avoid common event mishaps and throw a bash to remember. Check out these common problems and how you can remedy – or avoid – them. There is nothing worse than spending countless hours planning and executing an event only to find that half your guests can’t make it, or even worse simply don’t show up. To help make sure your event is a full house, make sure you plan invites well ahead of time. Start the planning process and send out a “save the date” up to 3 months ahead of time. This will allow your guests to put your event in their diary and reduce the likelihood of a double booking or a clash. Send out an RSVP request a month before the date of the vent and make sure you follow up with anyone that hasn’t responded. This will give you enough time to make up the numbers if need be. Think about how your guests like to communicate and use multiple channels. Physical invitation, personal email and social media are all a great way of communicating to make sure you touch base across all touch points. Any party planner worth his salt knows how important it is to keep guests fed and watered. Even the most spectacular event can leave a sour taste if there’s not enough food and drink to go around, and the key to avoiding this issue really comes down to preparation. It’s vital you keep an up-to-date guest list when arranging catering, as you’ll need an idea of how many mouths you need to feed. Cater to a few more people than have confirmed coming, as there’s always someone who doesn’t RSVP and it’s better to be over-prepared than under. If worst comes to worst and guests’ stomachs are rumbling for more despite all your best-laid plans, reach for your phone and call out for takeaways. It may not be gourmet canapes, but sometimes pizza is exactly what party guests feel like. As for drinks, it’s your host responsibility to keep guests safe. That means providing a range of non-alcoholic drinks to break up the bubbly. When the scene is set for a raging party, the easiest way to ruin the fun is by using a sound system that isn’t up to the task. While your wireless speaker may sound sufficiently loud at home, in a large venue with hundreds of people, it can easily be drowned out. As music is such an essential part of any event, it’s a good idea to hire av equipment that is up to the standard your party requires. Sound equipment like professional-grade speakers can make sure your music is heard above the throng. 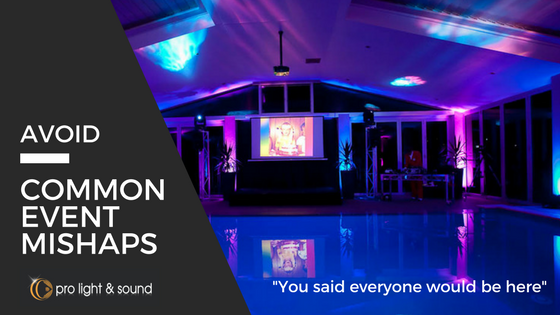 Get in touch now to pull off the perfect end-of-year event with supreme audio and visual clarity and listen to the rave reviews from guests for years to come.